An elegant tea-length dress for your girl. Featuring pearls and a sequin embellished bodice. The skirt has 3 layers of plain tulle overlay with a little touch of ruffle shape in the bottom. The waistline has a removable plain satin belt that gives an option for two different look, with or without the belt. True to size. 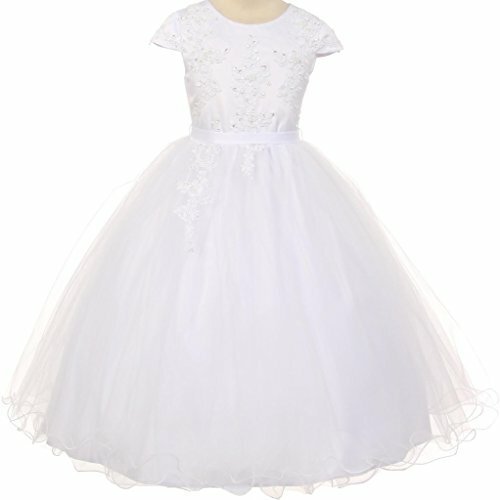 Perfect for First Communion, Flower Girl or other special occasion. Featuring pearls and a sequin embellished bodice. The skirt has 3 layers of plain tulle overlay with a little touch of ruffle shape in the bottom. The waistline has a removable plain satin belt that gives an option for two different look, with or without the belt.